Travelling in London can be challenging. Although public transport seems like the obvious choice, many people prefer the freedom of having their own vehicle. Scooters make a great choice for transport around London, for a number of reasons. If youâ€™ve never thought about owning a scooter in London, now might be the time to reconsider this. This article looks at the reasons you might want to own a scooter in London, and the benefits of owning one of our scooters. Why own a scooter in London? Scooters are a great choice for transport around a city. More than anything, theyâ€™re much smaller than cars, and so are much easier to park, and mean you can slip through small gaps in traffic. This is a massive advantage in a city like London, as residents will probably know, because itâ€™s more common to see standstill traffic than it is a freely flowing road. Here at Direct Bikes, we offer a range of scooters in a variety of engine sizes. 50cc scooters are the smaller engine choice, but still perfect for travelling around a city, as itâ€™s unlikely youâ€™ll get many chances to really let rip around the streets of London. Our 50cc scooters are restricted to 28mph, but this is more than enough for travelling between home and work, or for making journeys around the city. Another reason why scooters are ideal for London living is that theyâ€™re exempt from the congestion charge. This is true for scooters and motorbikes of all engine sizes, and so makes them a much better choice than cars. The congestion charge is useful in some respects, but is obviously a massive hindrance if you need to make daily trips within congestion zones. However, with one of our scooters, you wonâ€™t have to worry about it, and will essentially have free reign of the city whenever you need it. Another major advantage to owning a scooter is that theyâ€™re much more fuel-efficient than cars. This is true regardless of where in the country you live, but is helpful in London, where fuel prices are much higher than they are in the rest of the country. Both our 50cc and 125cc scooters can last for days (or weeks) before they need filling up again, and you should find that a single tank of petrol costs around Â£10-15. When youâ€™re looking at the much higher living costs of London, itâ€™s useful to save money wherever possible, including on fuel. As mentioned, scooters take up much less space than cars do, and this is really helpful in a large and busy city like London. Very few people have parking spaces at their homes, and so have to park on the road. The benefit of a scooter over a car is that you can park one almost anywhere, and youâ€™re much more likely to be able to fit it outside your house. Considering security should always be a primary concern, particularly in a big city, this can give you much greater peace of mind than leaving your car several streets away from your home. One of the biggest advantages to riding a scooter in London is that they let you get on the road a year earlier than you can with a car. You can legally ride a 50cc scooter at 16, whereas youâ€™re not able to start driving a car until youâ€™re 17. This is a big help for many young people, who need independence to get to work or college, but are either too young for a car or canâ€™t afford to run one. Whatâ€™s more, you only need a CBT to ride a scooter, as opposed to the lengthy instructions needed for a car. This means that you can get on the road after a dayâ€™s training, rather than several months. This is a massive advantage for young people who want to get on the road as soon as possible, and donâ€™t want to have to wait for lessons and their driving test. Our scooters are a great choice for London riders. We offer a wide range of designs that will suit almost any style. So whether youâ€™re looking for a retro design like the Milan or Tommy, or a more sporty model like the Scorpion or Python, there will definitely be a scooter to suit your look. Whatâ€™s more, we offer the same styles in both 50cc and 125cc engine sizes, meaning you wonâ€™t have to be restricted by age or riding knowledge when it comes to finding the right look. The scooters we offer are ideal for both new and experienced riders. All of our scooters, both 50cc and 125cc, have automatic clutches, meaning you can just jump on and enjoy the ride. While more experienced riders might prefer being able to change gears themselves, automatic transmissions are perfect for city riding, where youâ€™ll most likely be stop-starting for most of the journey. However, the gears are also very responsive, and so will allow you to let loose and whizz around whenever you get the chance. In addition to the great range of designs we offer, you can also further customise your scooter through your choice of colour, and the addition of a top box. Depending on the time of year, many of our scooters come with a free top box, which can be worth several hundred pounds. Top boxes are obviously really useful for carrying things around while riding, and give you loads of extra storage on your scooter. This is an offer you wonâ€™t find with many other dealers, and so you should take advantage while the offers are on. 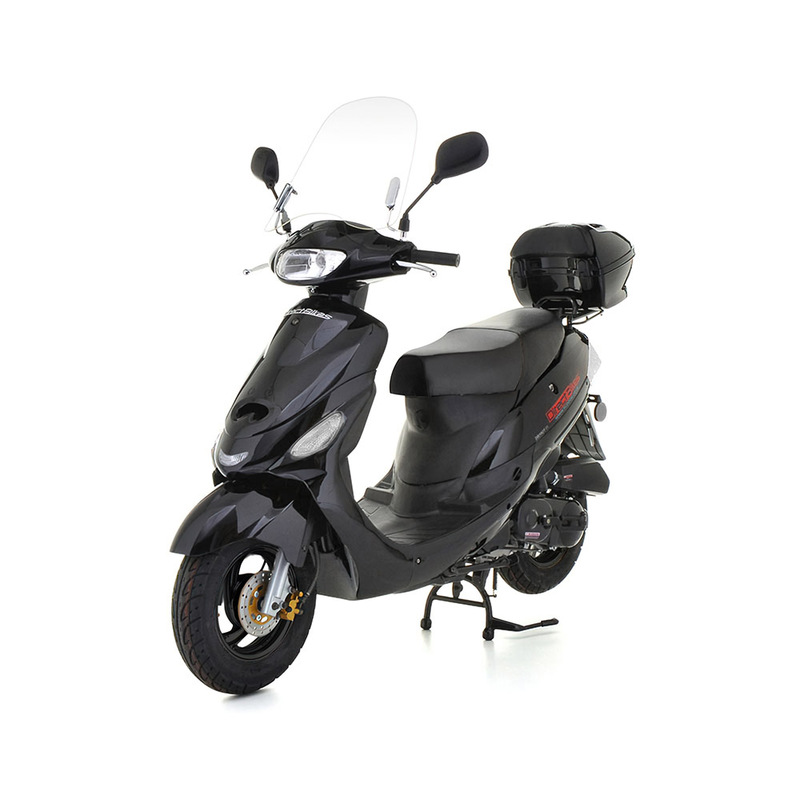 Also, our scooters are very reasonably priced, ranging from Â£999 to Â£1099, depending on engine size and design. Our scooters are much cheaper than many other dealerships because we donâ€™t deal with any middlemen, and so only deal direct with the manufacturer. This means we can pass the savings onto our customers, and so make scooters more accessible to a much wider audience. Even though our scooters are less expensive than many other dealerships, we also offer finance options if you canâ€™t afford a single payment. So whether youâ€™re looking for a 50cc Ninja or a 125cc Cruiser, but simply canâ€™t afford one, check out our quick and easy finance calculator. All it needs is a few details, and it can provide you with an answer in seconds. You can set the finance amount, and repayment time, giving you loads of flexibility. To make things even easier, we also offer to compare the insurance market to find you the best deal. Insurance is obviously a legal requirement, and comparing the market can be a complete minefield, particularly for new road users. Even if you have experience dealing with insurance, no one likes doing so, making this a really useful offer. We simply use the details you provide in your delivery and payment information to find the best deals for you, and then allow you to make any changes and choose the provider youâ€™re happiest with. How do you get one of our scooters? You might have noticed on our website that we donâ€™t have any dealerships located in London. In fact, we donâ€™t have any physical dealerships anywhere â€“ this is another way we can save money. So, youâ€™ve chosen which of our scooters you like, how do you actually get hold of it? Itâ€™s surprisingly simple. We deliver our scooters across the whole of London, regardless of your location. All you need to do is put in your delivery information as part of the payment process, just the same as you would when buying anything else online. We then use this information to calculate your delivery cost, and arrange the best time and date for your scooterâ€™s arrival. It really is that simple. Riding a scooter in London is a clever choice, mainly because it gives you much greater flexibility than a car does, and much more freedom than public transport. Our range of 50cc and 125cc scooters are suitable for pretty much anyone, and the designs will be perfect for almost any style. Whatâ€™s more, our insurance and delivery services make purchasing a scooter really easy, meaning you can concentrate on important things, and know that youâ€™ll be on the road as soon as possible. Why not browse our range of scooters, and see which one takes your fancy? Youâ€™ll be cruising the streets of London in no time at all.